Today, we left Porto Empedocle for Piazza Armerina, then Ragusa and Noto, and finally, Siracusa for the night. At Piazza Armerina, we found an elaborate ancient Roman villa. My favorite parts of the villa were the mosaic floors in each room, which were for the most part intact, as well as the private bath rooms–both hot and cold pools. 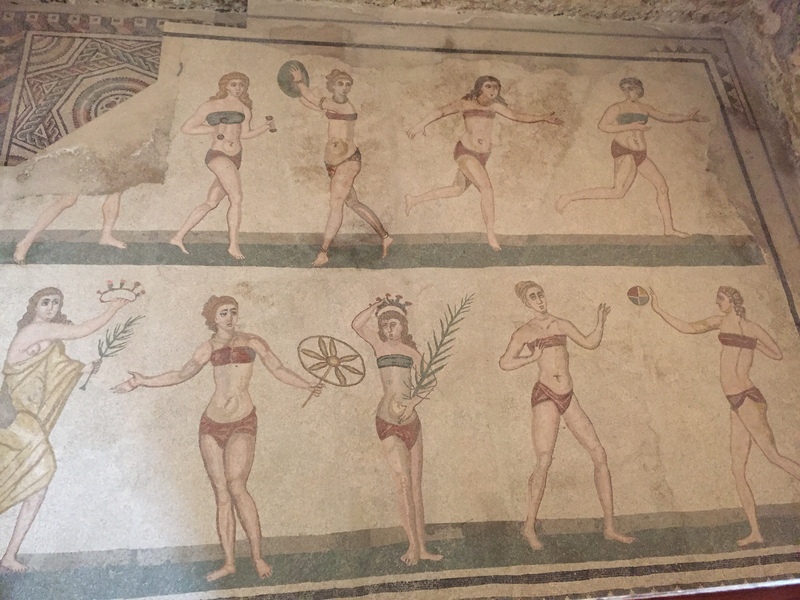 One of the mosaics that caught my eye was the one depicting a series of women in togas or bikini-like garments, pictured in this post, clearly doing various activities and exercises. After the village, we traveled to Ragusa, where the show about detective Montalbano was filmed. While the town appeared fairly quiet, it contained beautiful cobblestone streets and Baroque style churches. From Ragusa, we went to Noto, where we did a little “passeggiata” up and down the main strip, and stopped for aperitivi. Then, we departed for Siracusa, where we would stay the next couple nights.